1. HOW TO ASSIGN A FILL MATERIAL TO A PART? board, laminated board, etc. 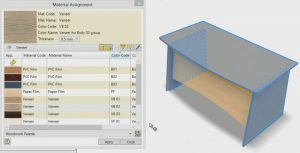 Open an assembly (or a part) that you want to assign a material to. Use the Assign command from the Woodwork Design toolbar. 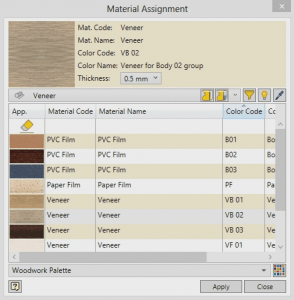 In the Material Assignment dialog window select a Material type from the drop down menu. 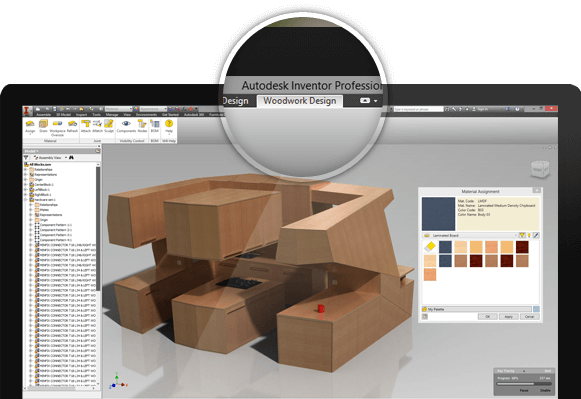 Then select the material that you want to apply from the Material list and click on components in the graphical window or the side browser and click “Apply”. 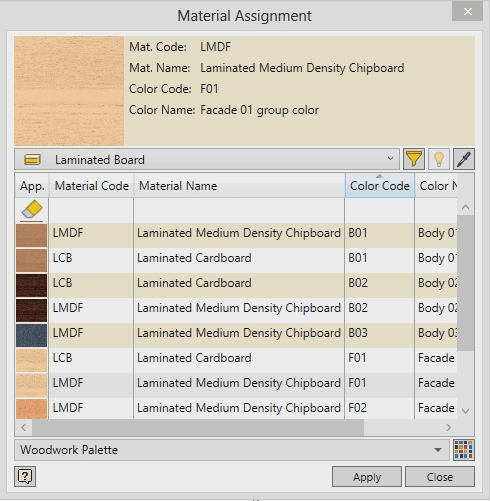 Select a fill material of any Board type, select components that you want assign the material to and click “Apply”. Use the dropdown menu to select a laminated board type and a fill material. Click on a components made from this type of material and click “Apply”. 2. How to assign a cover to a part? veneer, paint, etc. Some materials (e. g. Laminated Boards) have a pre-applied final covering layer. Meanwhile, some materials (e.g. Chipboards) need to be separately covered by veneer. Use a Veneer type cover material to assign veneers or protective compensation films to the surfaces of your model. You can also use a Veneer type cover material as an Edge banding cover. Apply edge banding in the same way. You can also set the thickness and position for the edge banding. NOTE: Tangent edges will be automatically included in selection. Edge banding of the same material may have a different thickness or a different position. You can rotate the grain direction of the fill material or of the cover material independently. Select the grain direction for the Fill material (Fill Grain) or for Cover material (Cover Grain). 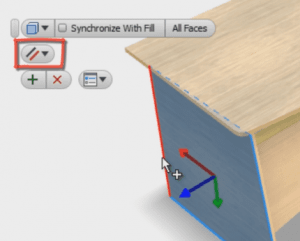 Click on the part you want to adjust grain direction. Select grain adjustment option – Align toEdge or Rotate by Angle. 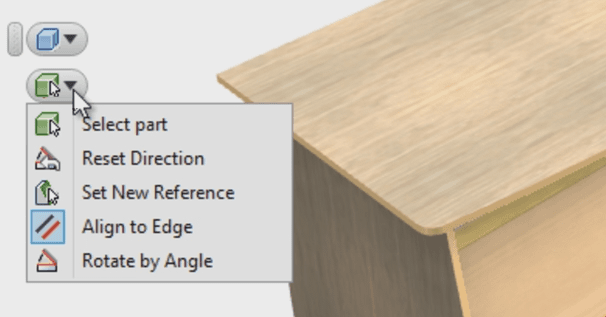 If you have selected align to edge, click on the edge to set grain direction in parallel with it. 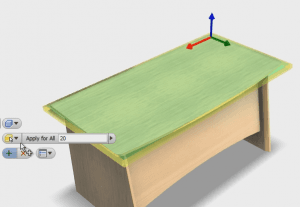 If you have selected rotation by angle, just enter an angle value. NOTE: The change in grain direction will have a direct effect on the size of a work piece. Oversize control is required for such operations as contour milling, veneer gluing etc. You can access it through Woodwork Design menu item Workpiece Oversize. 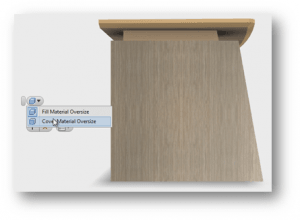 By default, the system automatically applies oversize to a fill material. You need to click on the part you want to set oversize to. Now enter an oversize value. Click “Apply” to add oversize to all the edges of your model or click on some particular edge to apply oversize to a given edge only. Green contour shows you the size of a blank, and yellow one shows additional oversize. You can use oversize control to set the size of the cover material. Click on “Cover Material Oversize”. Click on the cover material that you want to apply oversize to and enter oversize value to all edges or one selected edge. Make Group selection by used Material to change it for all selected parts. Open the Material Assignment window and use picker to click on the surface of the model that you want to make current. Use funnel to automatically select all parts with the above-mentioned current material (description of the current material is shown on the top of the window). Select a new material that should be applied to selected parts and click “Apply”. play_circle_filled 1. HOW TO ASSIGN A FILL MATERIAL TO A PART? play_circle_filled 2. How to assign a cover to a part? play_circle_filled 3. How to apply edge banding taking into account the banding thickness and position? play_circle_filled 4. How to control the grain direction of the cover and fill? play_circle_filled 5. How to set an oversize for a fill? play_circle_filled 6. How to set an oversize for a cover? play_circle_filled 7. How to make a mass replacement of one material by another?